I’ve been blessed to call Vashon Island home since I was in first grade. This means that I have had nearly twelve summers to explore the beaches, woodlands, and lagoons of this picturesque island. Lucky for you, this is the inside scoop on how to spend a day you’ll never forget in one of the most unique locations in Washington. No matter where you are coming from, whether it’s from Port Orchard, Tacoma, or Seattle, you’ll need to catch a ferry to get onto the island. If you are traveling from downtown Seattle I recommend that you take the C line on the Rapid Ride to Fauntleroy Way where you will find the ferry terminal on your right. It’s an easy twenty-minute bus ride followed by a fifteen-minute ferry crossing, all told it takes under an hour. Now, actually catching the ferry is generally a karmic experience that puts the balance of your commute in the hands of the “ferry gods.” Normally the boats run on schedule, but the heavy traffic of a summer crowd can delay a boat by up to 15 minutes, so plan accordingly. Many people consider the ferry ride one of the most unique and exciting parts of visiting the island, but Vashon has so much more to offer. 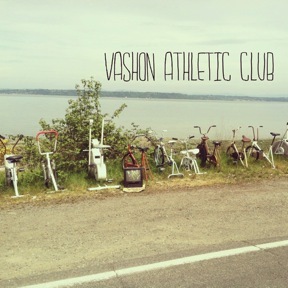 Vashon Athletic Club. Photo by Hayden Campbell. Once you are “on island” you’ll be delighted by the gentle curves of the one-lane roads and the charm of a place that has been largely forgotten by time. Each twist and turn will take you past another orchard, a horse farm, or perhaps a roadside athletic club. The deeper you go into Vashon, the higher the trees raise, and the tall towers of downtown Seattle disappear over the horizon. At this point you are officially on island time. If you are looking to have an authentically “Vashon” experience I recommend that you pack a picnic and enjoy your plunder at one of the many parks Vashon has to offer. A personal favorite is KVI (the only sand beach that the Island has thanks to its unique geography). KVI is a beautiful beach that faces the mainland and if you are lucky enough to catch a low tide a sand bar the size of a football field will reveal itself to you for all to enjoy. You can easily find parking on the corner of Chautauqua Beach Road SW and SW 204th Street. Exploring is always encouraged though, the island has over 45 miles of waterfront to discover so don’t be shy. Taking your bicycle here is also wonderful way to experience the island. From mountain biking to road biking, the island offers any level of rider a good challenge. Dependent on the route you choose you could be facing miles of meandering uphill climbs, but at the same time much more delicate country roads can serve as a respite for a more casual biker. One of the challenges of the island is the hilly terrain, but Vashon’s abbreviated stature makes it manageable to ride. I recommend you spend a day circumnavigating the island. This is roughly a 25-mile ride, which will take you through town, by the waterfront, and into the heart of the country. If you are coming from Seattle I would start south on Vashon Highway and take a right onto Cemetery Road (which will be a mile past town by the SBC stand). This will plunge you right onto the countryside where you will see a pond carved in the shape of Rudolph the Reindeer on your left (illuminated with a red nose in the winter time). Follow the bend to Old Mill Road, which will take you past Vashon’s Misty Isle Farms (acres full of happy cows on a beautifully kept ranch). This will turn into Wax Orchard Road which runs back onto Vashon Highway where you can begin your loop back north. Point Robinson Lighthouse. Photo by Hayden Campbell. 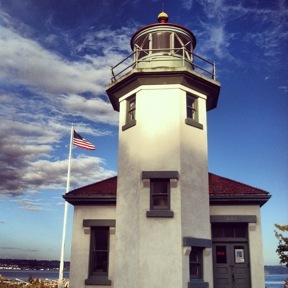 Of course you must see the Point Robinson Lighthouse, which is an iconic fixture of Vashon’s shoreline and is a must see, especially in the summertime. The lighthouse is surrounded by driftwood that has washed ashore, and behind it is a field of tall grass, which many native deer like to call home. Just around the bend of the southern tip is a cove where the water is much calmer. I’m not saying that I’ve spent much time swimming there, but the sweet salt-water air is a refreshing relief from the humidity of the city. 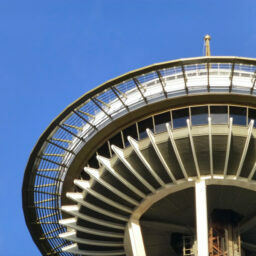 What is your favorite day trip from Seattle? I’d love to hear all about it. 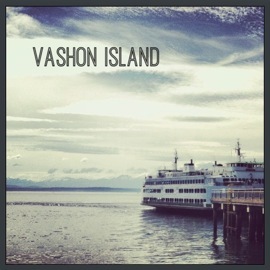 how long is the ferry ride to Vashon Island? 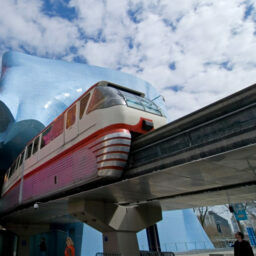 And if you’re leaving the island and headed to SEATAC — any sense of how long to allot for travel time? Hi Emmy! The ferry ride itself is only about 20 minutes from the north end of Vashon to the Fauntleroy Ferry Terminal. It will take another 30-40 minutes to drive from there to SeaTac Airport. However, depending on the time of day you’re traveling, be sure to factor in some buffer time for waiting in the ferry line and traffic once you get to the mainland. Thank you for this very well written post. 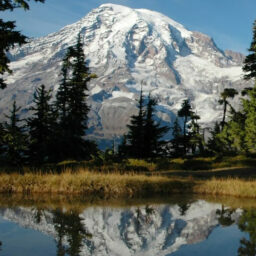 We are going to be in Snoqualmie soon and want to make it over to Vashon. 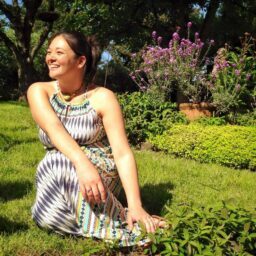 Are there rental cars, or tour cars on Vashon, or only bike rentals? We are only going to have an afternoon to visit the island and will have our luggage with us. Please advise if you see this post. Thanks! 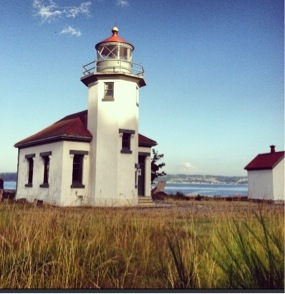 Thanks for a great write up about Vashon! We are glad you had a great time and hope to see you again.